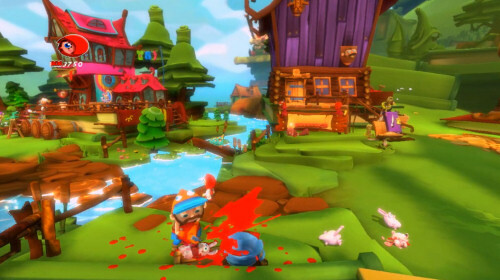 "The most gruesome demo ever to land on a console," said Little Red Riding Hood. "Furthermore, the White Room allows you to perfect your combat skills and combo building, so it’s just as useful for people who have already purchased the game." After you've taken a look at the "White Room demo," and decided to go for Fairytale Fights, you can now take advantage of the Naked Emperors tax break. "I am lowering Taxes for the residents of Taleville,” heralded the Naked Emperor. “During my recent quests I have gathered much loot. Therefore my imperial wardrobe expenses have been drastically cut and I’d like to share my economic success with all my subordinates by cutting taxes on certain goods, including Fairytale Fights the video game. This tax relief will only be active for a limited time so please grab your copy now!" You may agree with our review of Fairytale Fights, but a Holiday price drop may change your tune a little. Fairytale Fights may sound a bit more appealing at the $39.99 price point, rather than the original $59.99 - especially since you get to try it first. The White Room Demo is available on Xbox Live in both Europe and North America. The PSN demo is available in North America, but won't hit Europe until December 10th.